Amazon Web Services (AWS) has recently announced Internet Protocol version 6 (IPv6) Support for their Elastic Compute Cloud (EC2) Instances in Virtual Private Clouds (VPCs). In this blog post, we describe using the beta BOSH command line interface (CLI) to deploy a virtual machine (VM) running nginx (a popular webserver) to EC2 with a native IPv6 address. This blog post describes the procedure we followed to use the beta BOSH command line interface (CLI) to deploy an nginx webserver with a native IPv6 address (i.e. 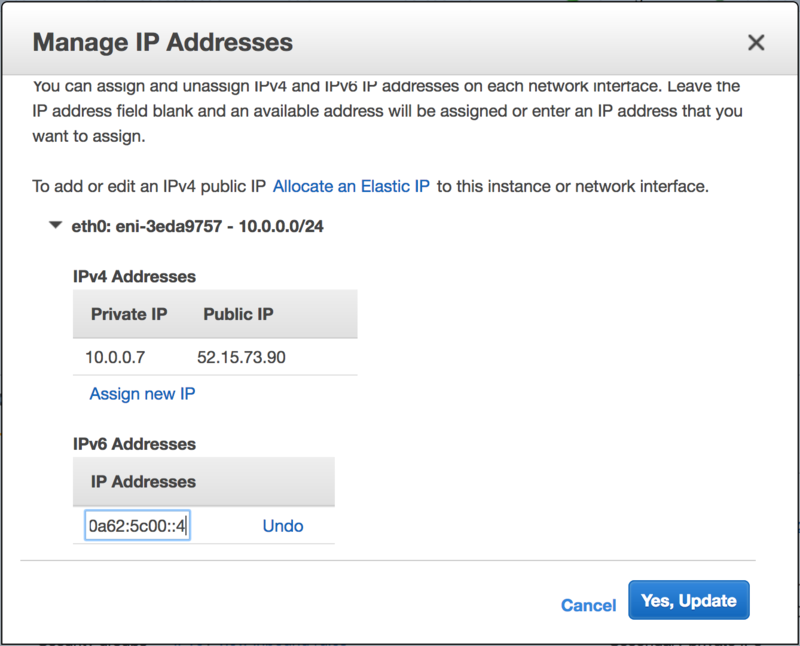 2600:1f16:0a62:5c00::4) to AWS in addition to its IPv4 Elastic IP address (i.e. 52.15.73.90). We were then able to browse the webserver via the IPv6 protocol. BOSH does not support IPv6. This is a proof-of-concept. Do not apply IPv6 to your production BOSH Directors or to BOSH CLI-deployed systems. We do not use a BOSH Director (an orchestrator VM) to deploy an nginx webserver; instead, we use the beta BOSH Golang CLI to deploy the webserver. We do not use the BOSH Ruby command line interface (CLI) to deploy the webserver; instead, we deploy with the beta BOSH Golang CLI. Golang has extensive support for IPv6 [Golang IPv6] . The procedure we follow is not entirely automated. Specifically, we use the AWS management console to manage the webserver’s instance’s IP addresses in order to auto-assign an IPv6 address to our deployed webserver. The webserver requires an IPv4 address and an IPv4 Elastic IP. The webserver is not exclusively IPv6. We use the BOSH os-conf release to enable IPv6 [IPv4-only Stemcells] with the enable_ipv6 job. We use the BOSH Dynamic Host Configuration Protocol (DHCP) release to manually start the IPv6 DHCP client daemon which acquires an IPv6 address from Amazon [DHCPv6] . We create an IPv6-enabled environment. The BOSH Documentation to create a VPC is quite thorough, and the instructions below are meant to complement the official instructions, not to replace them (for example, we do not describe creating a key pair nor allocating an Elastic IPv4 address). The instructions below describe the additional configuration required for an IPv6 deployment. Create an IPv6 VPC. Currently the VPC must be created in the us-east-2 AWS Region (Ohio). Select IPv6 CIDR block → Amazon provided IPv6 CIDR. We choose the IPv6 2600:1f16:0a62:5c00::/64 Classless Inter-Domain Routing (CIDR) for our subnet [IPv6 CIDR] . We were excited to discover that we could select Subnet Actions → Modify auto-assign IP settings → Enable auto-assign IPv6 address, but disappointed to learn that it had no effect on our BOSH-deployed VM (it had no routable IPv6 addresses when deployed). Attach it to the IPv6 VPC. ::/0 is IPv6 shorthand for all IP addresses. A routing table entry whose destination is ::/0 is the default IPv6 route. We enable all traffic, but we are aware that the security-minded should be much more prudent. Note that we enable traffic from all IPv4 sources (0.0.0.0/0) and all IPv6 sources (::/0). We deploy the nginx webserver. Here is our BOSH Manifest. IPv4 connectivity is as expected: The local address is set to 10.0.0.7, as specified in our manifest. IPv6 is enabled (as determined by the inet6 line); however, the address, fe80::30:8cff:fe56:50e9/64, is a Link-local address and not routable. We assign the address 2600:1f16:0a62:5c00::4 [IPv6 notation] . to our webserver. Note: we chose the address ::4 within our subnet for our instance. Addresses :: (i.e. ::0), ::1, ::2, and ::3 are reserved by Amazon and cannot be assigned to instances. We browse to our newly-deployed webserver’s IPv6 address. Note that we must bracket the IPv6 address. Our deployed webserver’s home page displays our workstation’s IPv6 address. [Optional] The Amazon console displays the instance’s IPv6 address next to the IPv6 IPs header. The IPv6 address may take up to 3 minutes to acquire after modifying the instance’s IP addresses to auto-assign an IPv6 address. [Golang IPv6] Golang has been designed with IPv6 in mind, at times at the expense of IPv4 users (”ParseIP always returns an IP in ipv6 ipv4-mapped address format”, “netstat only list ipv6 port”). [IPv4-only Stemcells] BOSH stemcells, as a side-effect of the hardening initiative, disable IPv6 by default through judicious use of kernel (system) variable settings. We did not need to un-blacklist the IPv6 kernel module in /etc/modprobe.d/blacklist.conf: IPv6 is built into the kernel; it’s not a module. 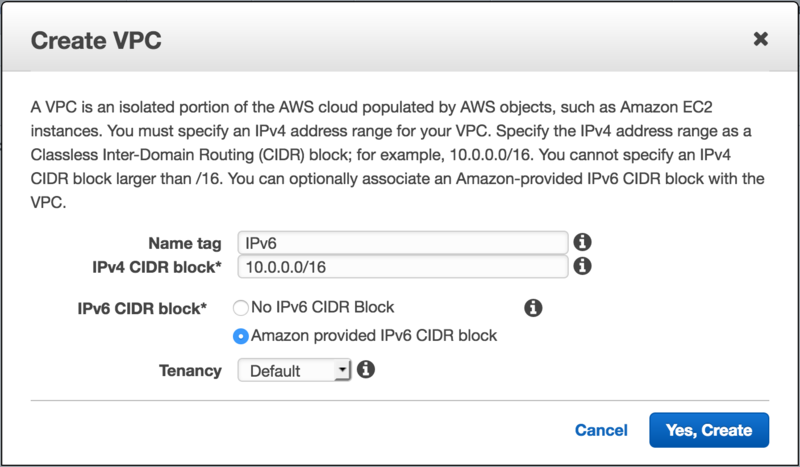 [DHCPv6] AWS uses DHCPv6 to allocate IPv6 addresses in lieu of the more common stateless address autoconfiguration (SLAAC), a component of the Neighbor Discovery Protocol (NDP). [IPv6 CIDR] Although IPv6 networks can be subnetted in a manner similar to IPv4 networks, the primary method of allocating IP addresses, SLAAC, requires a /64 subnet. Hence almost all IPv6 subnets are /64. 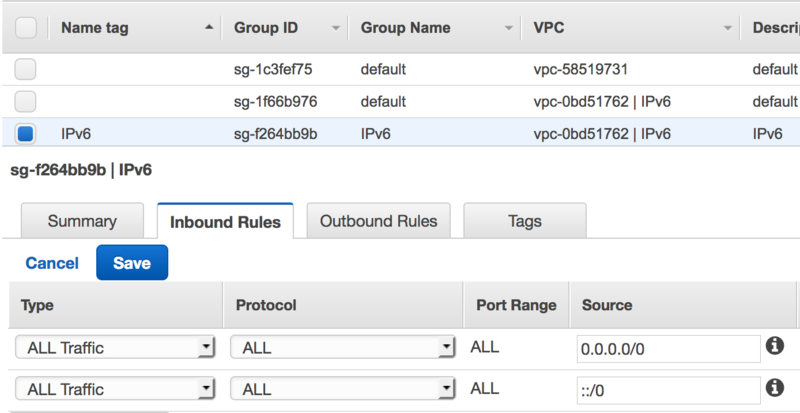 For example, although AWS allocates a /56 IPv6 range for each VPC, AWS requires all IPv6 subnets within the VPC to have a /64 CIDR. 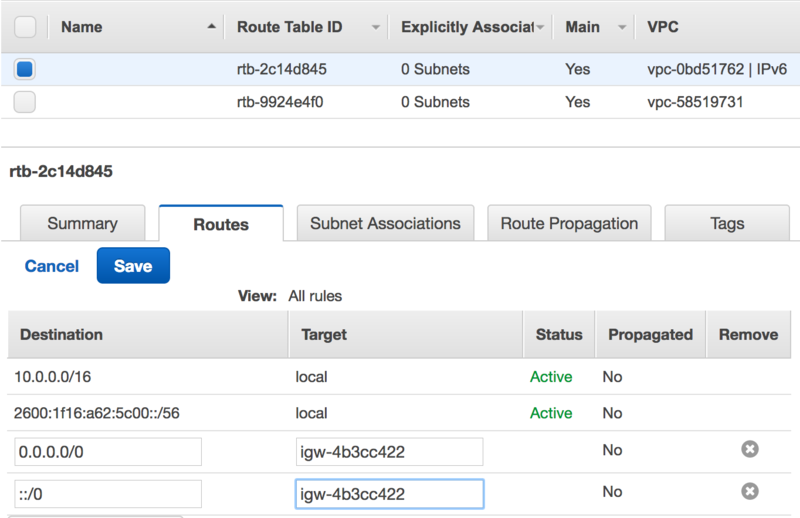 AWS is more flexible with IPv4 subnetting: A VPC’s IPv4 allocation can range from /16 to /28. The subnets also range from /16 to /28. [IPv6 notation] IPv6 address representation recommends separating each 16-bit group with colons (”:“), suppressing leading zeros (“0”), and using the double-colon (”::“) to represent one or more all-zero groups. Thus, our webserver’s address is represented as 2600:1f16:a62:5c00::4 although the unsimplified address would be represented as 2600:1f16:0a62:5c00:0000:0000:0000:0004. 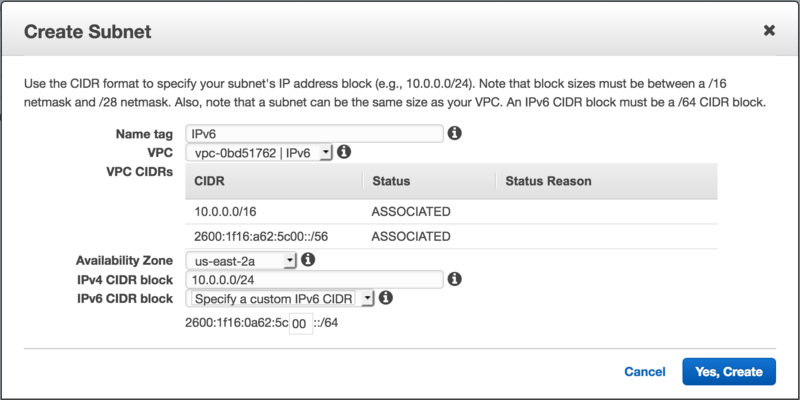 Amazon reserves the addresses ::1, ::2, ::3 in each IPv6 subnet.